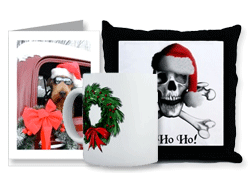 CafePress sent out an e-mail recently to its shopkeepers urging them to take advantage of the holiday shopping traffic. I’ve been a member of CafePress since 2001 for a reason. They are still my #1 choice when I need products made and their support department is top notch. They provided some tips on how to leverage the most sales during the holiday season. Promote now, cash in all season. Shoppers are looking for easy ways to find perfectly personal gifts for everyone on their list. All you need to do is spread the word. Add a banner on your main site or blog to advertise your shop. Send an email or newsletter to your customers. Announce to your shoppers that you have Holiday treats, just for them. You can use on our email scripts to help get you started. Visit the message boards your target shoppers frequent, and make friends to spread the word. If you can, add a link to your shop in your signature. Promote the upcoming Free Shipping promotion prominently on your main site. Check out this announcement for more promotion details. Check out our Holiday Prep Guide for even more great ways to promote, and read our latest chat transcript, Promoting Your Shop, to see what other Shopkeepers are saying.